The 220L-Series is a special LIMITED EDITION screwdriver set and are only available while supplies last! These exclusive ball-grip screwdrivers are outfitted with a premium acetate handle, a unique shiny finish, and the shanks have a special black chrome plate finish. Hurry up and get one of these rare sets before they are all gone! 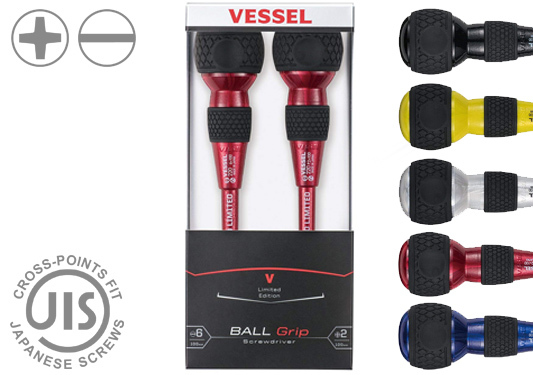 The 220L Series ball-grip screwdrivers may not look like a conventional style screwdriver but there are many advantages to the palm-grip design. It’s very versatile, ergonomically designed, and fits comfortably in the palm of your hand. When gripping the "ball-grip" handle, an operator can apply their body weight behind each turn for excellent leverage while fastening which results in higher torque output. Also, the built-in cushion finger knurl allows for quick turning and fine tuning of small fasteners.